Music Costs > How Much Does a Harp Cost? The harp is a multi stringed instrument that has been used since what seems like the beginning of time. Its musical qualities present a sophisticated sound that can capture everyone’s attention as it is very soothing and very pleasant to the ears. The cost of a harp will depend on the brand, the size, the type, the number of strings, the material it’s made from, condition and who it’s purchased from, but ultimately, the harp’s price can be from as little as $300 to more than $200,000. The costs noted below are averages we found for the most popular harp options on the market. Harpspectrum.org backs this up by saying if you’re lucky, one could cost a few hundred dollars and closer to $180,000 if you want the creme de la creme. They also note that a folk or level harp will probably be in the $1,000 to $5,000 range, while a pedal harp will start at $10,000. Small lever harps, which will have 30 strings or less, can cost anywhere from $130 to more than $1,500. A floor model level harp, which will have 32 to 36 strings, can cost anywhere from $2,300 to close to $5,000. A wire, double, cross-strung and/or historical replica harp can retail for anywhere from as little as $600 to more than $2,200. Pedal harps, which tend to be one of the most popular purchases will have 44 to 47 strings and will cost anywhere from $10,000 to well more than $25,000. A lap harp, which can fit on a lap, can cost anywhere from $20 to as much as $550, depending on the brand. Concert harps can cost $13,800 to $19,000, while grand concert harps, considered to be a premium for concert outings, can cost $19,000 to 32,500. Something small and simple such as a jaw harp, also known as a mouth harp, can cost anywhere from $1 to $25. While this isn’t technically a “harp,” it’s more for children and beginners. Harp kits will be available from some companies and included will be all the tools necessary to put together a harp. Usually, these kits will include the pre-cut wood, strings, hardware and instructions to put it together. Most of the time, minimal woodworking experience is needed. Folk harps will weigh less than 20 pounds and will have 34 strings. Lap harps will be just that — a harp that fits on your lap. This harp isn’t designed for a beginner unless it’s the only one you can afford. A student harp will usually have a square back and will be smaller in size made from an inexpensive wood like plywood. Professional model harps will be made to create the best tone possible and will have the added comfort, range and a good look. These harps will be made from a quality wood and will include the larger level harps and floor models with more than 34 strings. Travel harps will be designed for maximum portability and will be small, light and are just designed to be used as practice while you’re on the road. These harps are often purchased by those who already own one. Custom finishes are able to add a classical look to a harp. These finishes can vary from a two-tone finish to a hand-painted soundboard. Depending on the finish, these finishes can cost anywhere from $450 to $3,000. 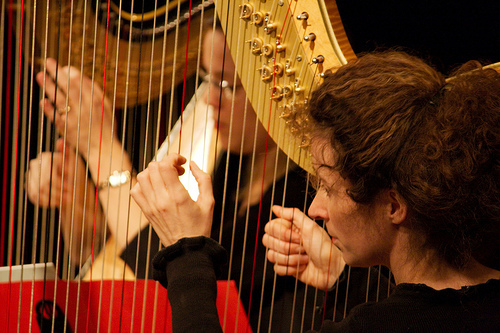 Harp strings, depending on the brand and retailer, can cost $60 to more than $350 per set. If purchasing strings separately, it can cost $6 to $28; again, depending on the brand. A tuning wrench can cost $20 for a standard one to $50 for a custom build. Universal tuning wrenches can cost about $60 to $80. A repair toolkit can cost $150 to $225. Accessories, such as cleaner and a case, are needed to protect the finish. A good case can cost $150 to $550. For advanced lessons, a harp teacher may be needed. Most lessons can cost $50 to $150 per 30 to 45-minute session. Self-help books and/or DVDs can cost anywhere from $20 to $50 for highly-rated materials. Amplification to amplify the sounds while play can cost anywhere from as little as $55 to $400. The costs will depend on the type of amplifier and type of harp it will connect to. Shipping, if purchased online or even specially ordered from a store, can be well into the hundreds, especially if the harp is worth tens of thousands. Some online retailers may not include a shipping truck, taxes or insurance. If you plan on playing for fun and will consider it a hobby, consider something on the smaller side. A harp with fewer strings will tend to be less expensive and some brands offer levers as an additional add-on. If you feel you want to move onto one with more strings, you can sell this one and invest in a new one in the future. Clive Morley says harp strings will be a lot like bicycle gears; the harder you have to work, the more you’re going to get in terms of sound. Because of this, if you’re playing with a tighter string, you will be able to create a grander sound. Consider the genre of music you will want to play. Those who plan on playing blues, new age music or even jazz should consider a full set of levers, while those who would like to make changes while they play should consider a cross-strung harp. A wire-strung harp is designed for those who may want to play traditional Irish or Scottish music. Some harps can get quite large, and because of this, know how you’re going to transport it from one point to another if you plan on traveling with it. Larger harps won’t be able to fit in a four-door sedan, so if you plan on teaching children in the future or want something portable, measure your trunk dimensions ahead of time to ensure it will fit comfortably. Buying used can almost always save you 20 to 40 percent or more. Are you able to work with wood or know someone who can? You may want to consider building a harp from scratch. If you’re just starting out, consider renting a harp for the next few months to see if it’s something you’re interested in. Renting gives you an idea if you will actually like playing the harp without the commitment of investing thousands of dollars. Some companies may even offer rent-to-own options. Due to the higher prices, financing is available to those who can’t pay in full. Celticharper.com says that cost won’t equal quality as some harps may be overpriced, while some may not offer the tone you’re looking for.